On September 25, the Greater Phoenix Chamber hosted renowned speakers who presented highlights to attendees about what businesses can expect from the global, national, and local economies in the 2019. With more than 750 attendees, Economic Outlook 2019 provided actionable, relevant economic information to help guests understand the economic challenges and opportunities, and how they can harness the state of the economy to grow their business. The leaders of the digital, data-oriented economy dictate standards that touch every business. Large employers like Amazon set the bar for wages and retail prices. In addition, companies that touch everyone’s lives through artificial intelligence—that includes most items on someone’s smartphone—establish the norms for people sharing personal information with technology. 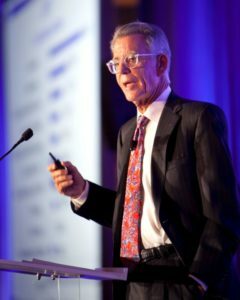 Wood discussed how companies and individuals can prepare for the changes coming to the economy as a direct result of technology growth and change, and how people must be prepared to do the unexpected. At the national level, Jim Huntzinger, Executive Vice President and Chief Investment Officer for BOK Financial, set the stage and provided insights on the national economy. According to Huntzinger, the national economy is in a good spot because unemployment, which is 3.9%, is at a historic low. By putting more and more people back to work, the U.S. is strengthening the economy. People who go to work every day contribute to the economy through purchases and their taxes. One way that companies are putting more people to work is by increasing hiring and broadening the hiring pool. Businesses are seeking alternative candidates. By expanding their reach beyond traditional college graduates and seeking individuals who can be trained and are eager to work, companies expand their ability to find talent. The economy is currently growing without too much inflation. Confidence remains high. Businesses and consumers are extremely confident in the U.S. economy. Individuals contribute 70% of the GDP in this country. The recent income tax cuts at the federal level contributed to this confidence and put the U.S. in a more competitive spot in the global marketplace. As companies and individuals continue to have high confidence in the economy, the U.S. economy will continue to support growth and increased employment based on the first two quarters of the year. Elliott Pollack, renowned local economist of Elliott D. Pollack & Co, took attendees to the micro level of the economy and discussed economic trends specific to Arizona. Pollack told attendees to expect continued economic growth that is steady and predictable. He said that the economy is finally beyond the great recession of a decade ago. Thanks to the recent tax cuts and continued fiscal stimulus, Pollack said that many could expect 2019 to be a good year. Since consumer confidence is very high, the unemployment rate is incredibly low, and more people are working, businesses are in a very good spot for growth and expansion. When it comes to economic challenges, Pollack told attendees that the biggest challenge for the next year is the more than 7 million job openings. Businesses are growing and expanding faster than the labor market can support. In fact, Arizona is seventh in the nation for job growth. Of all those new Arizona jobs, more than 88% are located in the Greater Phoenix region. Pollack said that the Greater Phoenix region is on track to create more than 60,000 jobs next year. As the economy moves into 2019, Pollack shared that he thinks growth is in the horizon despite the hurdles of the Great Recession and any potential trade issues. Interested in staying in the know on Arizona’s economic trends and business growth? Sign up for the Greater Phoenix Chamber’s Economy in Focus newsletter and attend the Chamber’s bimonthly Economic Development Insider Series events. The next Economic Development Insider Series event is on Wednesday, October 17. Register today!